For any of you that have been to Japan, or have maybe just heard about them, the 7-Eleven’s in Japan are pretty cool! Starting today, Capcom confirmed that a new Zelda inspired collaboration with Monster Hunter X will be available at 7-Eleven’s throughout Japan. This special assortment of Zelda goodness will be available for purchase until February 9th. 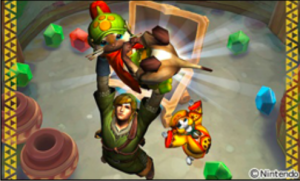 The special collaboration includes; a themed Zelda background, “Item Get” pose for your guild card, titles of “Tri-Force,” “Zelda,” “Heart Container,” “Legend,” and “Rupee,” and my favorite of them all, a “Zelda” Palico! What do you think of this latest collaboration? Share your thoughts in the comments below.